North Korea has been under one of history’s strictest global sanctions regimes since November 2017, the last time the regime conducted an illegal missile test. At the time, Pyongyang claimed it fired a new model of intercontinental ballistic missile (ICBM) called the Hwasong-15 at Japan. The United Nations Security Council, with minimal opposition from China, responded with strict sanctions on several of North Korea’s largest industries, including coal and seafood. North Korea has since ceased rocket tests and claims it has destroyed its Punggye-ri Nuclear Test Site, though many experts believe the site, after six nuclear bomb tests, may have partially collapsed and become uninhabitable. North Korea has not allowed international nuclear experts to inspect the site, only granting access to chosen international journalists with no nuclear background for a closing ceremony in May 2018. The United States has not urged the international community to lift sanctions and has not lifted U.S.-specific sanctions on North Korea in response to the Punggye-ri incident, nor to the meeting between dictator Kim Jong-un and President Donald Trump in June 2018. The South Korean news agency Yonhap reported that Meari, which it described as “one of the North’s propaganda outlets,” insisted in a column Monday that Washington owes “corresponding practical action” to North Korea in exchange for “active and preemptive efforts” like not bombing Japan since 2017. “If the U.S. responds to our active and preemptive efforts with corresponding practical action from the principle of recognizing and respecting its counterpart, relations between the two countries can move toward the destination at a fast speed,” the publication reportedly argued. 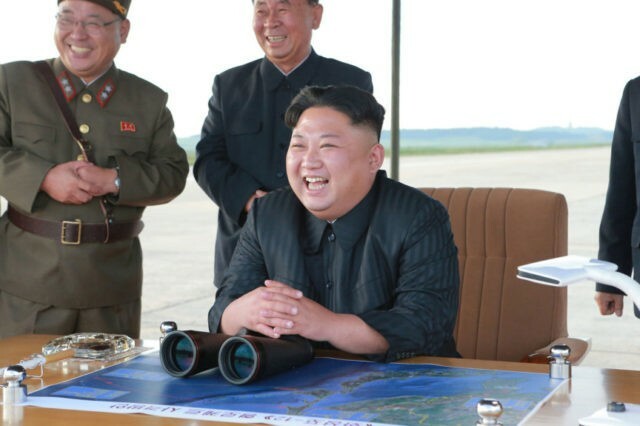 The state-run Radio Pyongyang also reportedly broadcast similar demands that the U.S. move towards “credible steps and responds with corresponding practical action.” The outlets reportedly did not offer examples of what such “credible steps” would look like, though the Korean Central News Agency (KCNA), the flagship government media outlet, regularly demands the lifting of sanctions. The publications also did not mention that President Trump announced last week he would meet Kim in person in Vietnam on February 27. There are no known North Korean media reports on the meeting, suggesting that North Koreans are not aware their dictator will meet the leader of the free world in the near future. Instead, North Korean media on Monday published a report on a visit Kim allegedly made to the Ministry of the People’s Armed Forces to deliver a “highly important speech” asking soldiers to safeguard the nation’s repressive socialist system. North Korean media taking a demanding stance on negotiations with the United States and emphasizing military resolve to uphold socialism indicate that Kim may be preparing to take a hard line on negotiations with Trump this month. The two are believed to be scheduled to discuss a path to denuclearizing North Korea and, thus, allowing for the formal end of the Korean War, technically ongoing since 1950. Yet one point of concern is whether both Pyongyang and Washington agree on what full denuclearization would look like and how to declare the denuclearization process complete. “We do not have a specific and agreed definition of what final, fully verified denuclearisation or comprehensive, verifiable, irreversible denuclearisation – whatever your preferred term of art – is,” Stephen Biegun, the State Department Special Envoy for North Korea, told reporters last week. He dismissed the Punggye-ri site as “not critical” to the North Korean nuclear weapons program, suggesting Trump will demand more from Kim in terms of ending the illegal program in exchange for sanctions relief.